Orthopedics: repairing broken bones and damaged joints. We offer SwiveLock bone anchor extracapsular repair of stifles, bone plating and pinning. Abdominal surgery: from cesarian sections, to foreign body removal from the bowel (enterotomy), to bladder stone removal (cystotomy), to correcting gastric dilatation volvulus (GDV). Castration: for colts, calves and lambs. We offer castration of normally descended and cryptorchid males. Cesarian delivery: typically for calves, lambs or kids too large to be born naturally. 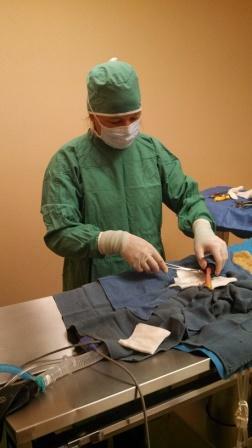 Soft tissue surgery: repairing lacerations, managing abscesses. The doctors at John Day River Veterinary Center provide full surgical services for your pets and livestock. Diagnostic imaging at the Veterinary Center includes state of the art ultrasound and digital radiography.